You can manage your tasks in several applications: Outlook, "Work Items" in combination with TFS or other non-Microsoft product. 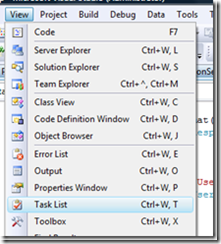 In small or private projects I haven´t a TFS and don´t want to use Outlook - one important point is the connection between the ToDo/Hack/what ever and the code line/code file. 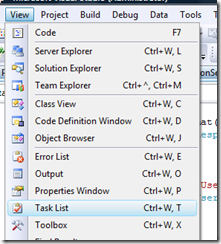 Just activate "View -> Task List" in Visual Studio and you get a small taskmanager. Just add "ToDo: ..." to create a new task. 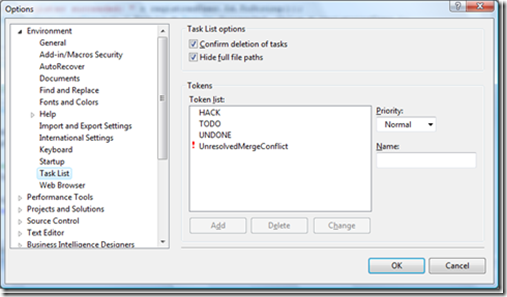 If you work in big projects or with a team you should only use the "Taskmanager" in Visual Studio for very small "ToDos" or "Hacks" - bigger ToDos should be placed inside other systems like TFS as "Work Items".